Find engineers, engineering firms, and their lead staff all in one consolidated database. Pull key contact information and start networking with engineers. Email lists from Bookyourdata.com are accurate, human-verified, and ready for you to download now. 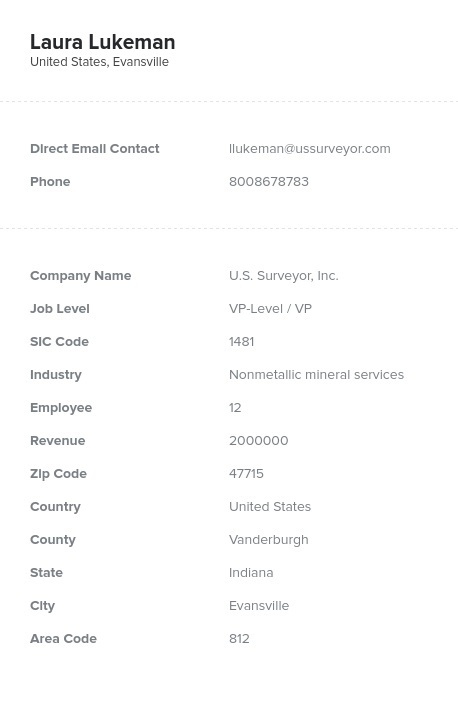 Gather sales leads from throughout the engineering industry with this accurate engineer email database, containing all the key contact information needed to start effectively marketing your company's products and services: names, titles, phone numbers, emails, and more. This contact directory pulls the sales leads from multiple companies and firms into one engineering mailing list, so that you can start targeting the right audience right away. Buy it, download it, integrate it into your CRM, and connect with a spread-out, knowledgeable group of engineers. Build strong business-to-business (B2B) relationships with those in your niche, boost sales, network with the right people, or simply generate interest among those in the industry with the help of this engineer email list. Bookyourdata.com aims to help you build stronger connections and reach out to the highly qualified people who would be most interested in your company. Let us help you find the right people by pulling accurate information either via this pre-built, targeted engineer contact list (which is updated daily) or our innovated, inclusive list-builder tool. By having the verified contact information of engineers, you can email leads that make sense to your campaign, sell to that unique group, and network with accurate data. Connect with brilliant professionals: Purchase this affordable engineering contact list and grow your business's reach today.